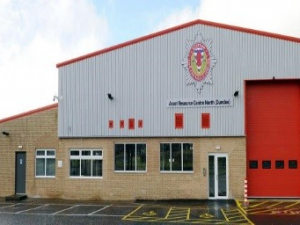 The North East Asset Resource Centre at Claverhouse Industrial Estate, Dundee for Scottish Fire & Rescue Service is a 2040m² conversion of a single storey light industrial unit with associated offices to form an Asset Resource Centre for the maintenance and repair of Scottish Fire & Rescue Service’s HGV and light vehicle fleet. The new facility gives the Service four strategically placed Asset Resource Centres, with two in the North and the others in Glasgow and Edinburgh supporting the rest of the country. The new facility comprises; offices, meeting room, messing facilities, locker rooms, mechanical parts store and a workshop fitted with 7 vehicle inspection pits for fire appliances, 3 hydraulic vehicle lifts for light vehicle fleet and ancillary rooms for remote works. 35 staff – including experienced mechanics, stores, ICT and property specialists. It includes a substantial garage for maintenance of fire engines, an IT hub and space for support staff.